Article 50? I'll see your 50 and raise you 30. Section 30, that is. Now, before we get completely lost in an arithmetical jungle, let me explain. The number 50 refers to the Article in the Treaty of Lisbon which a member state deploys to leave the European Union. The number 30 refers to the section in the Scotland Act 1998 under which further powers may be conferred upon the Scottish Parliament. The gambling metaphor rashly used in my opening lines may be thought germane. For Theresa May, for the entire UK, leaving the European Union involves a substantial measure of risk. A challenge she confidently hopes to mitigate. For Nicola Sturgeon, Scotland's First Minister, Article 50 brings both challenge and opportunity. To be clear, she believes that quitting the EU is a calamitous mistake, particularly as it involves leaving the single market. Ms Sturgeon sought to obtain a distinctive deal for Scotland within Brexit. She argued that, even if the UK was intent upon leaving the single market (which she regretted), Scotland should be enabled to retain membership, perhaps via the European Economic Area. Failing which, says the first minister, she wants the powers to hold a further referendum on Scottish independence. Powers to be granted by Westminster via Section 30. In pursuit of which, she is seeking authority from the Scottish Parliament. From arithmetic to bargaining to raw politics. The first minister is adamant that she is genuinely seeking compromise within the ambit of the UK. Her rivals say otherwise: that she has engineered conflict and always intended to move to a referendum. Which brings us to the exercise of power and the question of mandate. 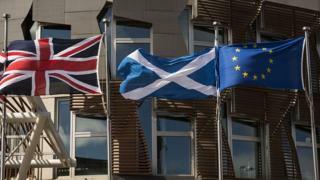 Nicola Sturgeon says her manifesto contained a promise of a potential further referendum if Scotland were to be taken out of the EU against the demonstrable will of the Scottish people. Scotland voted Remain, by 62% to 38%. The first minister wants a referendum between Autumn 2018 and Spring 2019. In time, she says, to allow Scotland to pursue a different path with regard to the EU. Offering a choice. Theresa May says that Scotland voted in 2014 to remain in the UK, and that the people of that United Kingdom voted, together, to leave the EU. She says she will not countenance a further independence referendum until after Brexit has occurred - and has settled down. Nicola Sturgeon says that is too imprecise, too prolonged - and is "unsustainable". Stand by for a constitutional stand-off. Poker faces optional. Image caption Will Theresa May and Nicola Sturgeon's fundamental differences over Brexit lead to a constitutional standoff?